A very attractive bee, called a Blue-banded Bee, has been seen recently in a garden in Anglesea. Jane Shennan, who lives locally, noticed some bees with unusual body markings. Instead of the yellow and black of the Honey Bee, the ones in her garden had a brilliant turquoise/blue colouring. After some research she learnt that they are a species of Blue-banded Bees, in the genus Amegilla. They are conspicuous because of their colourful, iridescent hair bands, relatively large size and hovering flight patterns. Some species are known to nest in sand, loam or clay soils and mud bricks. Nests are often found in large aggregations that are re-used for many generations. They are relatively short-lived with a lifespan of approximately 6 weeks. Ken Walker, Senior Curator of Entomology at the Melbourne Museum, provided some further details about their method of obtaining pollen. There are two types of male anthers (where pollen is stored and released): most plants present pollen on the outside of the anther which bees simply scrape off using their front legs. However, there is a group of plants in the family Solanaceae (eg. tomatoes, nightshade, etc.) in which pollen is stored inside a hollow tube-like anther. Bees cannot scrape off this pollen and need to shake it out of the inside of the tube. It was thought that bees wrapped their body around the pollen tube, changed their wing beat frequency and buzzed the pollen grains to bounce around inside the tube and finally to fly out of the tube. However slow motion photography has shown that when bees change their wing beat frequency, their heads nod rapidly and hit the pollen tube causing the inside pollen to fall out. 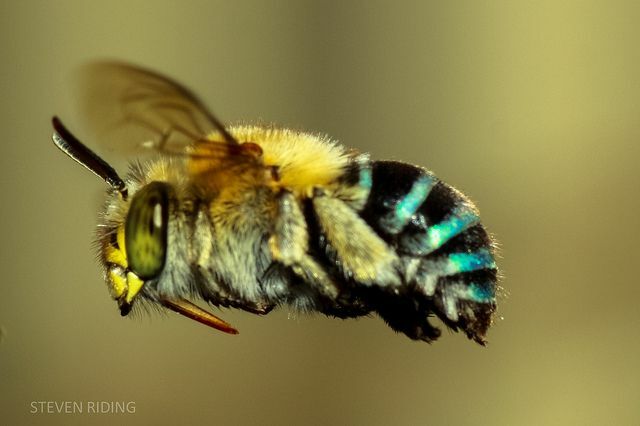 The Australian Blue-Banded Bees have been filmed ‘headbanging’ flowers at 350 times per second. It can be very satisfying to be able to observe nature unobtrusively: in this case a pair of Pied Currawongs building a nest and raising two chicks. It is better still to be able to record their progress and closely observe the behaviour of the birds as they tend their nest and young. Last October, Judy Beach, who lives at Moggs Creek, was able to see the nest from her deck and over a couple of weeks she carefully recorded and photographed the development of the young birds as they moved from nestlings to branching fledglings until finally they left the nest permanently. Away from the nest, the parent birds continue to assist them with learning life skills and where to find food. Unfortunately for the Hooded Plovers at Point Roadknight there is evidence that one of their chicks was killed by a dog. This is so unfortunate as it is unnecessary, and clearly illustrates the point that dogs should be kept on a leash and under control when in the vicinity of nesting birds. The one remaining chick is active and we hope it can get through this critical stage. A 1.5m wobbegong shark was trapped in a rock pool for several hours at Point Roadknight recently, exciting lots of interest. It escaped with the high tide, apparently unharmed.